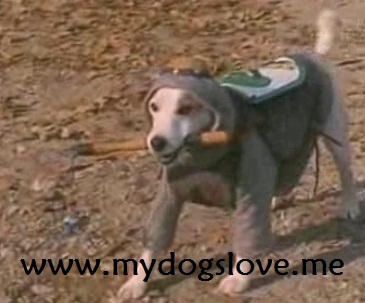 My Dogs Love Me: What's Your Story, Wishbone? Ever since I watched the TV series Wishbone, back when I was a kid, I've wanted to have a Jack Russel Terrier for myself. Aside from being adorable and small, it also helped wishing mine would be as smart as Wishbone. He talks, he thinks, he daydreams. He imagines himself as the protagonist of all the classic literature and folklore stories and parallels it to his friends' and his doggy dilemmas. Wishbone lives with his owner Joe Talbot and is almost always doing funny doggy stuff like hiding his treasures in the neighbor's lawn or devising a plan to get food. Larry Bentley had been the voice of Wishbone. And the real name of the doggy portraying Wishbone is "Soccer". Soccer continued to play Wishbone until 1998. His death in June 26, 2001 (a month after his birthday) was when the show ended. This particular picture is from Wishbone's daydream of Sir Walter Scott's Ivanhoe. He even uses some Old English in his script. I just love it.